An original letter of correspondence between Joshua Coffin Chase and Frank P. Lum of the Flacal Sales Agency. 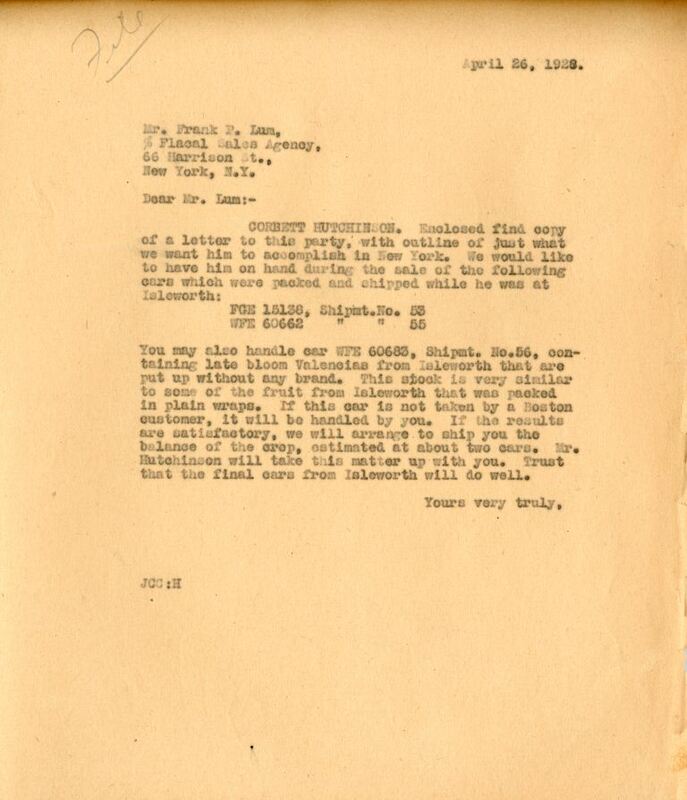 Topics discussed in the letter include an enclosed copy of a letter to Isleworth packinghouse superintendent Corbett Hutchinson and Hutchinson's upcoming business trip to New York City, New York. Original letter from Joshua Coffin Chase to Frank P. Lum, April 26, 1928: box 49, folder 20.91, Chase Collection (MS 14), Special and Area Studies Collections, George A. Smathers Libraries, University of Florida, Gainesville, Florida. Digital reproduction of original letter from Joshua Coffin Chase to Frank P. Lum, April 26, 1928. You may also handle car WFE 60683, Shipmt. No.56, containing late bloom Valencias from Isleworth that are put up without any brand. This stock is very similar to some of the fruit from Isleworth that was packed in plain wraps. If this car is not taken by a Boston customer, it will be handled by you. If the results are satisfactory, we will arrange to ship you the balance of the crop, estimated at about two cars. Mr. Hutchinson will take this matter up with you. Trust that the final cars from Isleworth will do well. Chase, Joshua Coffin. 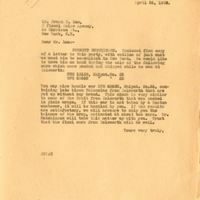 “Letter from Joshua Coffin Chase to Frank P. Lum (April 26, 1928).” RICHES of Central Florida accessed April 20, 2019, https://richesmi.cah.ucf.edu/omeka/items/show/2777.